The artist discusses his upcoming exhibition and book and his artistic practice. I first encountered John Hanning in the Visual AIDS office on his I SURVIVED AIDS poster, in which he appears as a child. 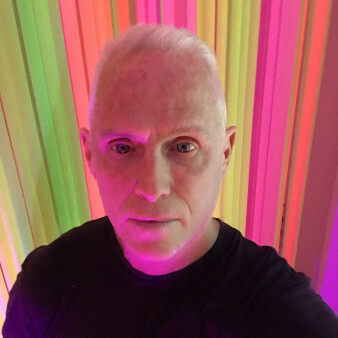 Hanning is a contemporary visual and literary artist who lives and works in Brooklyn and has exhibited internationally. His art centers around his queer experience and his life living with HIV/AIDS. I recently spoke with him to discuss his upcoming exhibition and book as well as his artistic practice. You have an upcoming solo exhibition, Chase, at Art During the Occupation Gallery, Bushwick in Brooklyn. What is your main focus for this exhibition, and what type of new works will you be showing? When the public walks into the gallery, they’ll walk into a large-scale installation, a maze. It’s like a ride. This work and this story is about a personal struggle with one of the worst diseases of our times and incorporates iconography representative of the times to tell the story. The icons tell the story and stand for different dominant themes in the story (religion, pop culture, danger and the paranoia of the time, militarism, craziness, bureaucracy, patriotism). There’s a predominance of symbolism to tell a story, and there’s a meeting of art and literature. Literature is all symbolism, so the conjunctive of iconography (visual arts) to text (literary arts) is a thread. Finally, the live performance tells the story. Chase opens on December 1 on the 30th anniversary of World AIDS Day. What does having your exhibit open on this important day mean to you? Twenty-three years ago, I was diagnosed with AIDS. The odds were against me, and I should be dead, but here I am. This work is a celebration of life over death. The work’s bright colors and pop culture influences are not only reminiscent of the ’80s but are life-affirming. 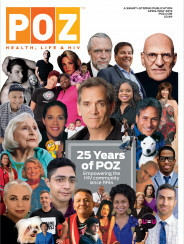 Since putting my I SURVIVED AIDS work out there, I have heard from hundreds of people from around the world who have shared stories of survival and loss. This is my story, but it is not just about me; it’s about all of us. It’s a celebration of the lives of the 35.4 million people globally who did not make it and whose stories were never told, the long-term survivors and the other 36.9 million living with HIV. Your first book, Unfortunate Male, looks back at the time of your diagnosis, when you were told you had only six months left to live. Now you are not only surviving but thriving. How has being a long-term survivor impacted your work? Your personal life? The book and the I SURVIVED AIDS work has brought a lot of attention to my practice. Making the book was a way to let go of a lot of trauma related to that chapter of my life. Even though I am one, I don’t think of myself as a long-term survivor. AIDS is something that happened in my life, but it doesn’t define who I am. Your latest book, Yonder, explores your past and growing up as a queer person before and during the AIDS crisis. What made you want to explore these early memories? In 2012, I made a series of 12 mixed-media collages on 12-by-12 wood panels for Brooklyn Museum’s GO, a community-curated open studio project. I was turning 50 and wanted to make work that spoke about my life experiences. The series is actually the visual outline for the book and tells the story of Yonder pictorially. The book is a memoir of sorts, and there are references to the book in Chase. You reflect frequently on your sexual experiences growing up, but you describe them in a very removed way, almost like a narrator. What has it been like to be so open and occasionally explicit? This is a political statement, a way of speaking truth to power. I was raised Southern Baptist and listened to lies and fear spew out of the preacher’s mouth. Those lies and fear continue to spew out of the mouth of the White House press secretary, the daughter of Mike Huckabee, a Christian minister and former governor of Arkansas, where I was born. 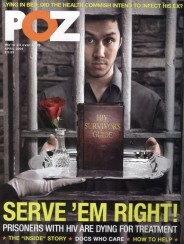 In 1992, Huckabee wrote, “If the federal government is truly serious about doing something with the AIDS virus, we need to take steps that would isolate the carriers of this plague.”He also said “I feel homosexuality is an aberrant, unnatural and sinful lifestyle, and we now know it can pose a dangerous public health risk.” Vice President Mike Pence appears to support conversion therapy. Enough of this limited thinking, enough of the lies and fear. The stories I’m sharing about growing up queer and my youthful sexual experiences are true, this is who I am—this is who I was born to be. Your latest works have a lot of imagery referencing pop culture and current and past events, while also referencing your personal history, resulting in new meanings and your own personal symbology. For example, can you tell me about the images you used in the piece, Saints and Sinners, 2018, and what they mean to you? Pop culture repetition and bright colors are the influence of the ’80s on my life and work, almost a criticism or a paranoia of remembering the time. Pac-Man, disco balls, religious statuary are the very mania of iconography itself and the visceral responses they conjure: religious fanaticism, hedonism, xenophobia. Pac-Man is manic, and there are eyes looking accusingly in every direction. Your latest work also marks the return of your alter ego, Cosmo. Can you tell me about him and why you decided to bring him back? I first sketched Cosmo back in the ’80s when I was a part of the original Fido Dido team. Over the years, I’ve made attempts to bring Cosmo into my work, but anxiety always got in the way—I feel like I’ve overcome those issues. When I was dying of AIDS I had no regrets, but I was sad about all the unfinished work, mostly Cosmo. When you see him now, he’s naked because that’s how I sort of feel after putting so much personal narrative out there. After Chase opens and Yonder is released, what do you have planned next? I’m working on a series of multimedia collages, using only the colors of the ghosts of Pac-Man, and you’ll see a lot more of Cosmo in the near future. Tickets for the immersive performance are free.